See the Karen Blixen Museum, home of the author of "Out of Africa"
If you're looking for an African wildlife safari that you can afford, look no further. 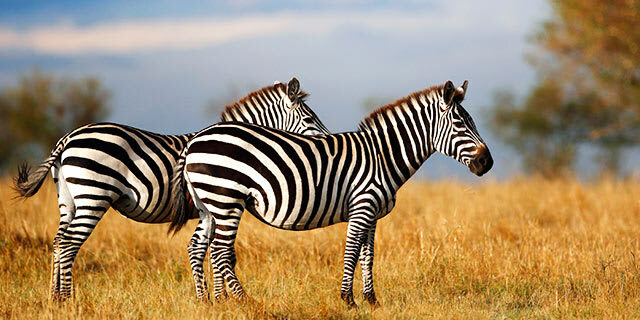 Savvy travelers and novices alike include Kenya & Tanzania on their list of safari tours for a very good reason. Both countries are blessed with an abundance of spectacular wildlife and beautiful landscapes. Everywhere you go, from the busy cities to the rolling plains of the Masai Mara, the people are always friendly and welcoming. 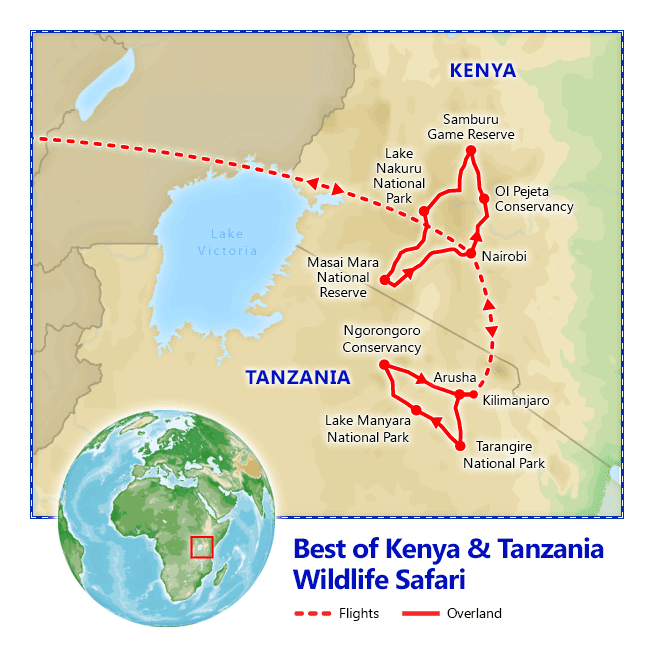 With more than 50 parks from which to choose in Kenya alone, and almost 25% of Tanzania protected as nature reserves, it's hard to decide where to go, but everyone agrees that the Masai Mara and Samburu parks in Kenya and the Ngorongoro Crater in Tanzania are must-visit sites. 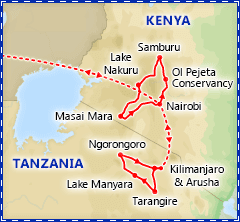 Our Best of Kenya & Tanzania safari tour includes them all plus a lot more! 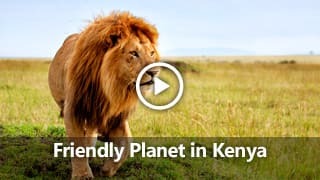 And like all Friendly Planet tours, you'll enjoy the very best of Kenya and Tanzania at prices that are as amazing as the countries themselves. 1. Flight may not operate if weather conditions are not suitable. 1. All visitors to Kenya and Tanzania must obtain a visa. Comprehensive visa instructions will be included in the confirmation packets to all passengers. Please inquire with the Kenyan Consulate about reduced visa fees. 3. Departure tax paid locally. Want to fly from another city? Unfortunately, we do not offer flights from cities not listed, but you can book your own connecting flights. Some schedules may require an overnight in NYC prior to departure for Kenya. Accommodations: 2 nights Tamarind Tree Hotel, Nairobi or similar. Included meals: Dinner. This evening, enjoy a welcome dinner at the famous Carnivore Restaurant. After lunch on your own, continue to the Kazuri Bead Factory Store, where the guide will explain the hand-making process. Founded in 1975 by Lady Susan Wood, the factory started as a tiny workshop experimenting in making handmade beads, only employing two Kenyan women and today has grown to employ many other women, most of them single mothers. Then, visit the Karen Blixen Museum. Before becoming a museum in 1991, the house and surrounding 4500 acre farm where owned by "Out of Africa" author Karen Blixen from 1917 until 1931.
endangered Rothschild's giraffe. There are also several warthogs which roam freely with the giraffes. Guests may feed the giraffes from a raised feeding platform. Return to the hotel and enjoy the remainder of the day at leisure. Accommodations: 2 nights Samburu Intrepids Tented Camp or similar. Included meals: Breakfast, lunch & dinner. Full Day Itinerary: After an early breakfast depart Nairobi heading north, you'll pass near Thika and continue north through some breathtaking scenery dotted with rushing mountain streams and fields of tea and coffee. After passing the town of Nanyuki, you'll continue north, eventually reaching a dusty outpost known as Isiolo, the last major stop on the journey into the remote northern frontier district. From here it's a fairly short hop to Samburu, where you’ll arrive in time for lunch. In the afternoon, depart on your first game drive, returning to the camp as the sun sets. Full Day Itinerary: Enjoy another day of game viewing drives in the Samburu Game Reserve. One drive in the morning and another in the early evening, in a safari vehicle with roof hatch access for perfect game viewing and photography. Guided by your expert driver, enjoy searching for animals native to this fascinating and beautiful area. Accommodations: 1 night Sweetwaters Tented Camp or similar. Included meals: Breakfast, lunch & dinner. Full Day Itinerary: After breakfast, depart for the 90,000 acre Ol Pejeta Conservancy, located on the equator, in Kenya’s Laikipia District, between the foothills of the Aberdares and the snow-capped Mount Kenya. The conservancy hosts a large variety of animals, including the “Big Five”, Grevy’s zebra, Jackson’s hartebeest, cheetah and chimpanzee. Enjoy lunch at your camp. In the afternoon, visit the Jane Goodall Chimpanzee sanctuary followed by a game drive. In the evening sit by the lit waterhole to view the animals. Accommodations: 1 night Sarova Lion Hill Lodge or similar. Included meals: Breakfast, lunch & dinner. Full Day Itinerary: Leaving Sweetwaters and Mount Kenya behind, you'll head west to Nyahururu, still known to many as Thomson's Falls for its 237-foot cascade. Now travel in a southerly direction to your next destination, Lake Nakuru. This park is a rhino sanctuary, offering the rare opportunity to see these endangered animals. It's also home to rare Rothschild's giraffes, buffalo, leopards and lions. Once in the park, there will be a game drive en route to the lodge where you will have lunch. Following lunch there is an afternoon game drive in Lake Nakuru. Continue to Sarova Lion Hill Game Lodge as the sun sets. Accommodations: 2 nights Mara Intrepids Tented Camp or similar. Included meals: Breakfast, lunch & dinner. Full Day Itinerary: After breakfast, set out for the Masai Mara National Reserve, which borders Tanzania's Serengeti National Park. Every year, between June and September, millions of wildebeests and zebras migrate into the Mara in search of water. The timing of this phenomenon varies, depending on the rains, but they usually start heading back to the Serengeti in October. 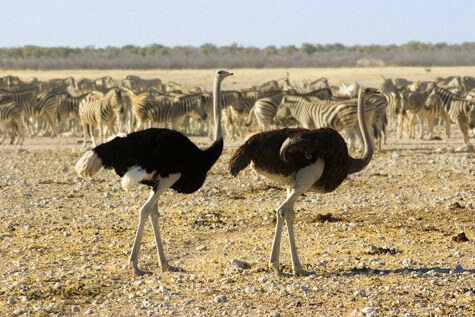 Whether you see the migration or not, the grassy plains and lush landscape offer a huge variety of game including lions, cheetahs, buffalo and abundant bird life such as ostriches, cranes and storks. Enjoy lunch at your camp upon arrival, then set off for an afternoon game drive. Full Day Itinerary: Today you will take two safari drives, one in the morning and one in the early evening, in a safari vehicle with roof hatch access for perfect game viewing and photography. You'll have the choice for an early morning Hot Air Balloon Safari, which provides a thrilling opportunity to soar high over the plains for animal viewing from above. Whether you go by air or land, you will enjoy searching for animals native to this fascinating and beautiful area accompanied by your expert guide, who will amaze you with his ability to spot game hidden in the bush. Optional Excursion: Masai Mara Hot Air Balloon Safari & Champagne Breakfast, $450 per person (purchased locally or $430 if pre-booked). Take to the sky over herds of wildlife in the Masai Mara game reserve, flying in a hot air balloon. The balloon can soar over the most inaccessible and undisturbed parts of the reserve and offers a bird's eye view of the plains below. After an hour or so in the air, your safari finishes with a champagne breakfast in the bush. This is certain to become a once in a lifetime experience you will remember long after returning from Kenya! Flight may not operate if weather conditions are not suitable. Accommodations: 1 night Mount Meru Hotel, Arusha or similar. Included meals: Breakfast & lunch. 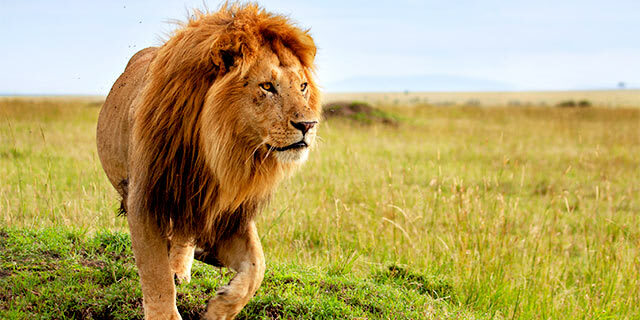 Full Day Itinerary: After breakfast, enjoy your final early morning game drive before departing the Masai Mara Park, and continue through of rolling wheat and barley farms of Narok, (the district headquarters of this part of Maasai land) to Nairobi. Arrive back into Nairobi in time for lunch. Later, transfer to the airport for your short flight to Kilimanjaro Airport in Tanzania. After completing border formalities, check-in to your hotel in Arusha, a pleasant city that serves as a trading center for the surrounding farmlands. Accommodations: 1 night Tarangire Sopa Lodge or similar. Included meals: Breakfast, lunch & dinner. After breakfast continue on to Tarangire National Park. Full Day Itinerary: After breakfast, continue to Tarangire National Park, home to thousands of elephants, and, in the dry season, game which congregates along the river after having migrated from the Masai Mara. Large herds of antelope, zebras, gazelles, buffalo, wildebeest, leopards, rhinos and many smaller mammals also make the park their home. Tarangire is an ornithologist's paradise, rich in an incredible variety of birds. Enjoy a game drive en route to your lodge located deep within the park. Lunch will be served at the lodge followed by an afternoon game drive in Tarangire Park. Accommodations: 2 nights Ngorongoro Oldeani Mountain Lodge or similar. Included meals: Breakfast, lunch & dinner. Full Day Itinerary: From your lodge in the Tarangire area, you depart to the border of the park viewing game en route. At the town of Makuyuni you turn west and continue the journey up through a scenic escarpment with stunning views over the distant Lake Manyara. 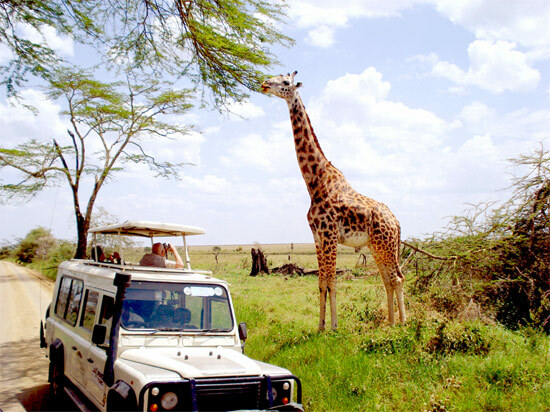 Descend the Great Valley and enter Lake Manyara National Park for a half day game drive. Enjoy your packed lunch. Leaving Lake Manyara behind, the journey continues North West across the stunning hilly countryside of Karatu and the highlands which is filled with wheat and coffee plantations. Arrive at the Lodge for dinner. Full Day Itinerary: After breakfast, depart for the Ngorongoro Conservation Area. The completely intact rim rises 1800 feet above the base and offers the very finest game viewing in Africa. It is considered one of the world's greatest natural wonders, and its abundant game includes rare species such as black rhinos and cheetahs. 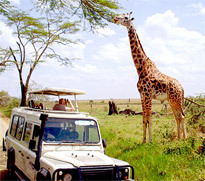 The magnificent scenery will thrill even the most experienced safari traveler. Taking along a picnic lunch, descend into the crater. With the passage of time, the crater floor has become grassland with a lake in the middle, a sanctuary and source of water for the abundance of wildlife found here. Later this afternoon, return to your lodge. Accommodations: Mount Meru Hotel, Arusha, Tanzania (day-use room). Included meals: Breakfast & lunch. Full Day Itinerary: Heading southeast, travel back to Arusha through the scenic Rift Valley escarpment with great views of Lake Manyara in the distance. 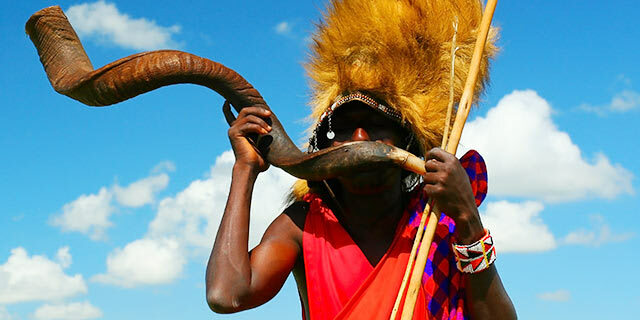 Pass by the Masai Steppe, filled with picturesque African villages and banana plantations. Enjoy lunch at the hotel in Arusha and check-in to your day use room. This evening, transfer to the Kilimanjaro Airport for your short flight back to the USA via Nairobi. HEALTH REQUIREMENTS/PRECAUTIONS: Tanzania requires proof of yellow fever vaccination upon entry for passengers arriving from Yellow Fever Endemic Countries, such as Kenya. Click here to find a local vaccination center. Mount Meru Hotel in Arusha is a modern hotel that offers you a beautiful setting and breathtaking views with 178 rooms. Large windows in the room give you an incredible overlook of the lush gardens that cover the expansive nine-acre property by the foothills of Mount Meru, which serves as a backdrop from nearly every point on the property. Although Mount Meru Hotel is a modern facility, the wildness of Tanzania is never far away. When you walk through the property, you may see some of the area's avian life. This 5 star colonial lodge is situated on a picturesque hill with spectacular views onto Oldeani Mountain and The Ngorongoro Crater Rim. The lodge is elevated with 360 degree views that extend all the way to Lake Eyasi and Lake Manyara. The property is set on 40 acres of pristine lush green gardens and local vegetation with over 130 species of birds. The lodge is accessed over a pond and one's first impression is the grand central hallway with wooden trusses looking out over the fire place, infinity pool and out onto Mount Oldeani, which is part of the caldera of the would famous Ngorongoro crater, only 7.5 miles away.All 50 suites have panoramic views of the surrounding area. All rooms are tastefully decorated, equipped with a private bathroom with bath, complimentary toiletries and a hairdryer. The hotel offers international & traditional cuisine with outside and inside seating overlooking Oldeani Mountain. Open for breakfast, lunch, High Tea and dinner. The hotel also offers a cigar & whiskey bar. What should I know about Tanzania? Check out our guide for travel tips, the best time to go, blog posts, videos, and more.